Senator Bob Menendez (L) and Republican challenger Bob Hugin (R). 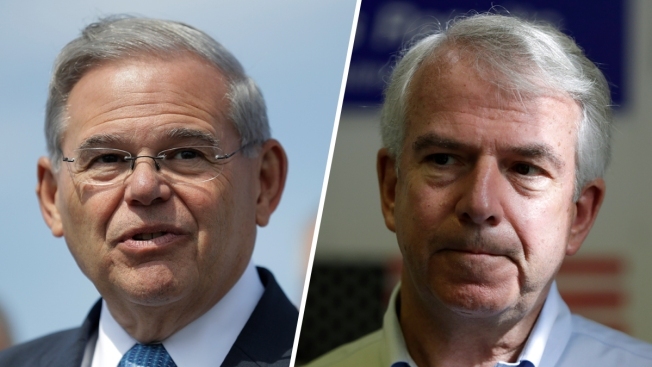 With just five weeks to go until the midterm elections, New Jersey’s incumbent U.S. Sen. Bob Menendez is in a statistical dead heat with Republican newcomer Bob Hugin, according to a new poll by Stockton University. Menendez leads with 45 percent to Hugin’s 43 percent in the race for the U.S. Senate, according to a poll of 531 likely voters. Libertarian Murray Sabrin came in at 3 percent with an additional 8 percent of voters undecided. “With a two-point lead falling within the poll’s margin of error, the Senate race at this point is up for grabs,” Michael W. Klein, interim executive director of the Hughes Center, said. “Bob Hugin has been attacking Senator Menendez on ethics with a heavy advertising campaign. However, with so many voters still unfamiliar with the Republican, Menendez will likely try to define his challenger in negative terms,” Klein added. Last year, Menendez’s federal bribery trial ended in a mistrial when the jury said it was hopelessly deadlocked on all charges against the New Jersey politician and a wealthy donor. The Democrat was accused of using his political influence to help Florida eye doctor Salomon Melgen in exchange for luxury vacations in the Caribbean and Paris, flights on Melgen's private jet and hundreds of thousands of dollars in campaign contributions to organizations that supported the senator directly or indirectly. Nearly 60 percent of voters polled said the corruption charges against Menendez are an extremely important or significant factor in their vote. But, 51 percent also said “a claim by that Hugin profited off an expensive cancer drug while CEO of a pharmaceutical company is an extremely important or significant factor in their votes,” according to the poll. “It’s clear that voters are unwilling to re-elect Bob Menendez, a corrupt, career politician who violated federal law and abused the power of his office for his donor friend, a convicted felon who blinded patients with lasers, scammed seniors, and stole $73 million from Medicare,” Hugin campaign manager Stacy Schuster said. Hugin, a native of Hudson County, graduated from Princeton University before entering the Marine Corps in 1976. He served for eight years. After earning an MBA from the University of Virginia, he went to work at J.P. Morgan. Over the years, he rose to managing director. In 1999, he took over as chairman and CEO of a large pharmaceutical company called Celgene, based in Summit. Hugin retired this year and is a first-time candidate He says he's running as an independent Republican in a state with roughly 900,000 more Democrats than Republicans. Menendez, the son of Cuban immigrants, served in the House from 1993 until he was appointed to fill a Senate vacancy in 2006. He has chaired the Foreign Relations Committee and was a major player in the unsuccessful bipartisan "Gang of Eight" effort to overhaul the nation's immigration laws in 2013.